While women play an important role in agriculture, environmental and natural resource management, they have greater financial or resource constraints, and lower levels of access to information and extension services than men (Tall et al. 2014). Because of these gender inequalities, women appear to be less able to adapt to climate change (Huyer et al. 2015). Rural women’s workload, e.g. biomass and water collection, is affected by natural disasters and the changing climate with consequences on family nutrition, childcare and education. Cultural norms related to gender roles may limit the ability of women to respond to or make quick decisions in the face of climate events. For example, in some households where men are working off-farm in cities, women may lack the power to make timely farming decisions or to convince their husbands to agree to new practices (Asfaw et al. 2015; Goering 2015). Huyer S. 2016. 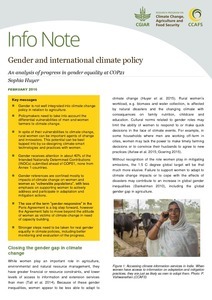 Gender and international climate policy: An analysis of progress in gender equality at COP21. CCAFS Info Note. Copenhagen, Denmark: CGIAR Research Program on Climate Change, Agriculture and Food Security.